Raindropss, renowned youth based social organization and Vel Tech University have set a World Record on 3rd December, International Day of Persons with Disabilities at C K Nayudu Stadium in their University campus. The World Record event titled as “வானமே எல்லை” aims to promote “Together a better world for all”, an understanding of disability issues and mobilize support for the dignity, rights and well-being of persons with disabilities. The overall aim is to show non-disabled people that a person with a disability can be a vibrant member of society. 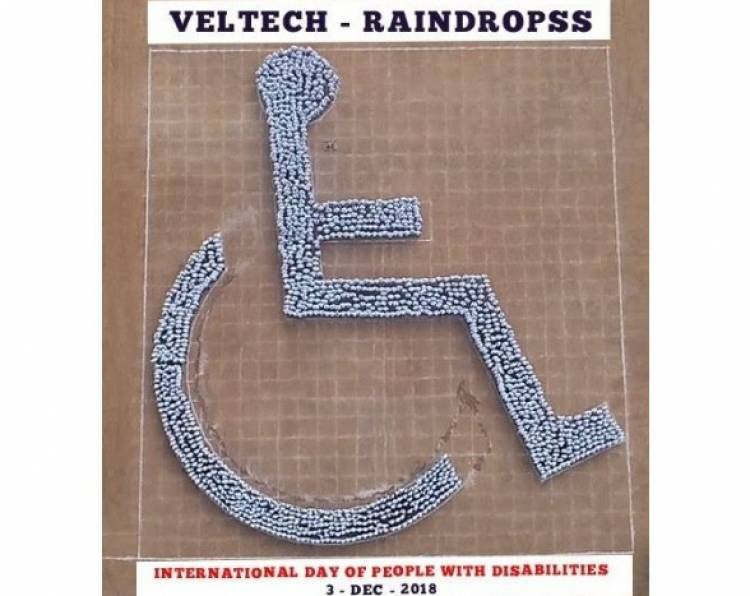 To create a significant awareness among people, Raindropss and Vel Tech University joined hands to break the existing world record of largest human image of a Wheel Chair. The new world record has been achieved by Raindropss and Vel Tech University with 1550 participating and forming the LARGEST HUMAN IMAGE OF A WHEEL CHAIR. On this occasion, Wheel Chairs were donated to the differently abled from Tamil Nadu Udhavikaram Differently Abled Welfare Association. The Record was officially announced by Vivek Raja, South India Head of Asia Book of Records and the certificates were awarded to Vel Tech University and Raindropss. The team has submitted the required documents to Guinness for the approval. The Visual for theme Song Raindropss “வானமே எல்லை” composed by A.R.Raihanah, penned by lyricist Madhan Karky and sung by Bhavatharani and Aravind, was also released during the record attempt. This song conveys a strong social message, a person with a disability can be a vibrant member of society, by proving to themselves that there are many things they can still do. VGP Groups Chairman V G Santhosam, Music Director and Goodwill Ambassador Raindropss A.R.Raihanah, State President of TamilNadu Udhavikaram Differently Abled Association TAP Varadhakutti, Advocate Velmurugan and Girija Velmurugan, Managing Trustee of Anandam Senior Citizen Home, Bhageerathy Ramamoorthy and many others witnessed the world record attempt in the presence of Founder Chancellor & President of Vel Tech University Dr. R. Rangarajan, Foundress President Dr. Sangunthala Rangarajan and Vice Chancellor Dr. V. Ramachandran.